First Id like to say that I enjoyed the 1998 Hot Rod article "Magnum Manifesto" by Al Kirschenbaum. It certainly explained the various Mopar 318 - 360 combinations well, and it also went that additional step to inform the reader of the reasons "why" certain parts were developed, as well as theyre compatibility. do all of the technologies involved in the Soft Head proper justice. It should also be noted that the original Hot Rod Magazine story created enough stir in the entire industry to "force" more rapid deployment of advanced engine technologies. The fact that thousands of readers (and TV viewers) now had knowledge of what a few guys in Texas had accomplished, was a great embarrassment to the industry and it marked the beginning of a different mind-set for the manufacturers. Previously, the big companies dictated what and when the market needed "new" technologies, but in June of 1985 the corporate philosophy was forced to change. The immediate results were readily seen in the immediate performance gains that followed, which has lead to formerly "impossible" efficiencies of the automobiles being produced and sold today. When "The Soft Head" article was written in March of 1985, the focus of the article was largely dictated by my interviewer from Hot Rod Magazine. He wished to concentrate principally on the intake ports contribution to the process and I readily complied. I was actually somewhat relieved that the focus of the article had concentrated only on one small area of the overall "Soft Head" concept because we certainly didn't want to give away the farm for the price of a magazine. I was, however, able to sneak in the fact that cylinder pressure relative to crank angle was "critical" and that cylinder pressure (quality of the burn) was what rotated the crankshaft, rather than big airflow numbers. Sufficient airflow is indeed necessary, but the real key is creating a quick, complete burn and all other components need to be designed as support systems for the combustion process. Id like to think that "The Soft Head" article possibly caused some people to look at engine design from a few "different" directions and, as swirl now seems to be "the" buzz word, I believe that I succeeded. Fifteen years have passed and there are many technical aspects relative to what we were doing at the time which can now be openly discussed with the industry and public. One of the major topics relates to the actual mixture that is delivered to the cylinder. As it turns out, we were not actually delivering a homogenous mixture to the cylinder like we thought in early 1985. If you have the time and an open mind, read on. So, were I to rewrite "The Soft Head", Id first begin with the configuration of the "combustion space", which is defined by the shape of the combustion chamber and the piston crown. A properly engineered "combustion space" both dictates and permits much higher compression (static and dynamic) with the outstanding ability to prevent detonation, and so we feel that the "shape" is everything. Ideally, we want the combustion rate to create maximum cylinder pressures well past TDC to take advantage of optimum mechanical geometry for crankshaft rotation and the process also needs to be fast enough to complete the "burn" prior to opening the exhaust valve. The easiest way to view the combustion process is to take 50 pieces of charcoal and place them in a solid circle so that all the edges are touching. Now take 50 pieces and place them in a spherical shape. These two respective arrangements represent a conventional combustion chamber shape and a "Soft Head" chamber. Light the center piece of charcoal in each configuration and see which one ends up burning all the pieces first. The spherical or ball of charcoal will win by a large margin, as there is greater contact area between all the individual pieces. Applied to combustion chamber and piston configurations, this would mean that as much of the mixture as possible should be forced into a very small, isolated volume of space prior to and during ignition. This configuration typically demands that the static compression ratio be somewhat "high", as were shoving all the fuel and air molecules into one small space, where theres greater contact area, resulting in a quicker and more complete burn. While we are still forced to configure the combustion "space" by the number and size of the valves we are using, we have found what we considered to be several "ideal spaces" during 1985. The best and most complex configuration would place the inlet valves perpendicular to and flush with the deck or at a 0 degree angle in any axis. The exhaust valves needed to be inclined and very small in diameter, as their opening was not away from the cylinder wall into the chamber, but opening from the relative center of the cylinder outward toward the cylinder wall, necessitating that their stems pass partially between the inlet valve stems. This produced a combustion chamber, which was a "trench", housing only the exhaust valves with a spark plug at each end. 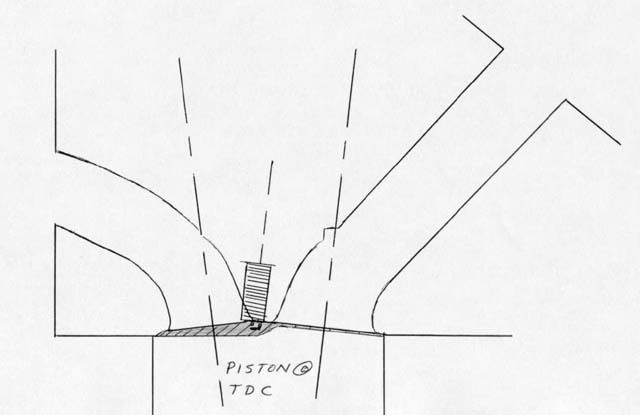 In order to create the "trench", where all the fuel and air molecules would be confined when the piston is at TDC, the piston must fit the intake side of the chamber (or deck) closely and have only enough valve relief to allow for intake valve margin. Any additional volume anywhere other than the "trench" simply invites secondary pocketing and adds to the surface area, all of which are undesirable qualities when youre after high quality burn characteristics. So, looking at the deck side of the head, one would view a flat surface with two flush intake valves and a "trench" on the exhaust side, housing the exhaust valves with a spark plug at each end. In operation, since the piston is flat, or minimally conformal to the intake valve margins, the entire mixture will be forced into the "trench" chamber to facilitate the burning process, which begins from the plug at each end and burns to the center. I suspect that about now some readers are wondering how to eliminate the intake valve relief in the piston of a performance-oriented engine. It requires some rather special camshaft design with little or no valve opening during the "normal" overlap cycle. Well discuss this aspect when we get to the "support systems" which relate to cam design. T1 (the ideal combustion space) is a side cross sectional view of the combustion "trench" chamber through the valve centerlines. Note the valve stem intersection above the chamber. Also note that the entire intake side is flat, or totally a quench area. The only space left has two exhaust valves that open from the center out, forming the combustion chamber proper. 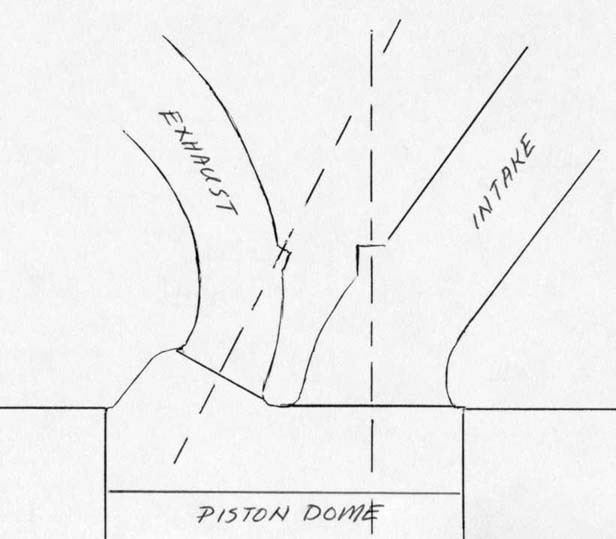 The piston dome is a flat top. 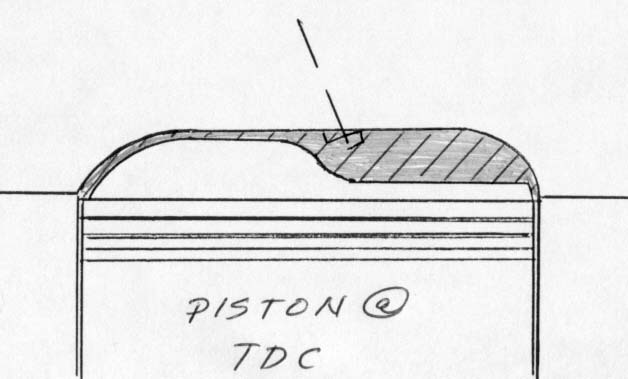 T2 shows the "trench" combustion space in a cross sectional view with the piston at TDC. Note that the flat top piston has completely displaced all the volume on the intake side of the chamber and the entire mixture content is now in the "sweet spot" on the exhaust side. T3 is a view through the exhaust side of the "trench" chamber. Note that there is a spark plug at each end of the "trench", so the burn will begin at each end and meet in the center. The piston is flat. T4 is a view of the exhaust side of the "trench". The flat top piston is at TDC and the only space for the compressed mixture is about the exhaust valves with the plugs at each end, promoting both a controlled and rapid burn. The trench chamber discussed is for an "ideal" engine where anything goes, but many of the efficient burn characteristics can be applied to more conventional four and two valve heads. In any case, the chambers greatest volume should be around the exhaust valve (with the piston at TDC) and the spark plug should be located high and in the same area as the exhaust valve. As the piston top is the floor of the chamber for a short period of time, it needs to be shaped to displace as much volume on the intake side as possible. This will generate a piston with a dome on the intake side and little or none on the exhaust side. 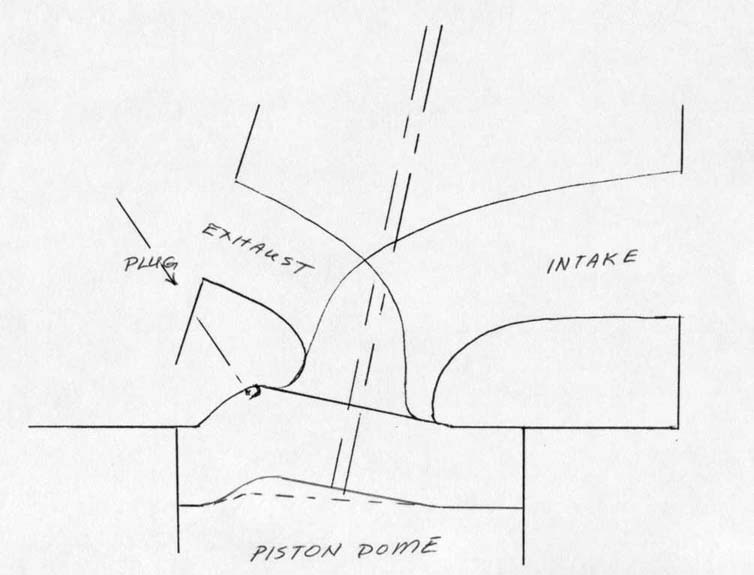 The pressure differential created by both the quench area, and the area displaced by the intake dome will force the mixture to the area of greatest volume about the exhaust valve(s), where the spark plug(s) reside. In turn, a very large portion of the mixture will be available in the area where the natural ionization process begins and subsequent exposure to the initial flame front will producing a quick and thorough burn for all of the remaining mixture. So we want to mechanically force the mixture to the exhaust side, ignite, and briefly confine it for complete combustion. To make this particular concept even more efficient, we can shape the piston dome and quench pads to force the mixture to swirl into the preferred portion of the chamber, creating swirl combustion. As the inlet port will induce a swirling mixture to the cylinder which is rotating due to inertia, the proper piston to chamber shapes can effectively reaccelerate the swirling charge, while ever confining it to our exhaust side "sweet spot" for ignition and initial burn propagation. This type of mechanical enhancement is quite obvious in almost every cylinder head / piston that we develop, especially when rules confine us to use "production" dimensions. If the combustion process is quick and complete, there will be very little burning when the exhaust valve opens, and the exhaust gas temperature will be very low. A quick burn also permits us to use less ignition timing advance to complete the combustion cycle and, therefore, the engine is doing less "negative" work since were not trying to compress as much ignited and rapidly expanding mixture. Unfortunately we cant light the mixture at TDC and still complete the burn by BDC (with gasoline), but we can run only 5 - 15 degrees advance and create a thorough burn cycle. Then, by keeping the exhaust valve shut to a point very near BDC, we can gain a little more work from precious cylinder pressure. At these crankshaft angles the mechanical "push" is admittedly small due to the rod angle, but, as we only produce power on one of four strokes, we opt to take maximum advantage all the pressure available. On the exhaust side, everythings easy. Open the exhaust valve at or near BDC, allow an efficient (sonic) port to efficiently remove the inert gasses, and then seat the valve near TDC. Piston to valve clearance isnt an issue here, as we have all that "space" over and around the exhaust valve. The actual length of the cams' events is entirely a function of maintaining the correct combustion space, while allowing enough fresh mixture in and spent gasses out, as required by the engines displacement, desired output, and permissible operating RPM range. This now brings us to the subject of ports. The exhaust port is a proper place to start. For years weve tweaked exhaust seat configurations and used theoretical radiuses to create ports that flow well without turbulence. In the late '70's we found that if you decreased the cross section of the exhaust port to the point where the flow exceeded mach 1, the amount of work necessary to properly scavenge the cylinder was almost nil. By placing the port's smallest cross section well below the seat insert, the flows maximum velocity was now in an area where we could control the sonic shock and use its placement to allow the port to literally "pull" the flow out. On the flow bench, these ports tend to become extremely turbulent and noisy until approximately 7% net lift is obtained and then the port smoothes out, making a smooth "scream" that certainly requires ear protection. The early "noise" was created when the flow was in the trans-sonic range, and once past mach 1, its a screamer. To relate to typical exhaust port operation on a flow bench, one normally needs to adjust the pressure drop with each incremental valve opening to maintain the correct test pressure. With the sonic configuration, once port velocity is past mach 1, little or no additional adjustment to the pressure drop is necessary and the flow rate will continue to increase dramatically with each sequential valve opening. Since were not using additional pressure to increase flow as the valve opens, we have, not only a very efficient port, but also a port that acts as a vacuum, literally sucking the exhaust out, and eliminating the pumping losses normally incurred. An additional benefit is that since the point of maximum velocity is "down in" the port, the seat area is no longer sensitive at all, and simple three angle seats now flow as well as the radiused seats previously necessary. Torque is also greatly enhanced by the small area ports, and the shapes and areas used to control and place the shock wave do not allow the ports to flow well backwards at all, so there is little inert gas left to contaminate the fresh intake mixture. The intake port: where to begin? These are some design criteria that are used in all our intake ports. Start by assuming that the manifold runner is a portion of the port and the combination is designed to deliver a well-prepared mixture to the port and cylinder. The entry to the port should always be a tiny bit larger than the manifold exit, and it should effectively capture the mixture and straighten it so we may manipulate it down stream. The intake port should never be in line with the cylinder bore axis, or there will be little quality mixture turbulence, which is a necessity. While on this particular subject, we do not feel that "tumble" delivers the proper mixture quality necessary to support efficient combustion, period. 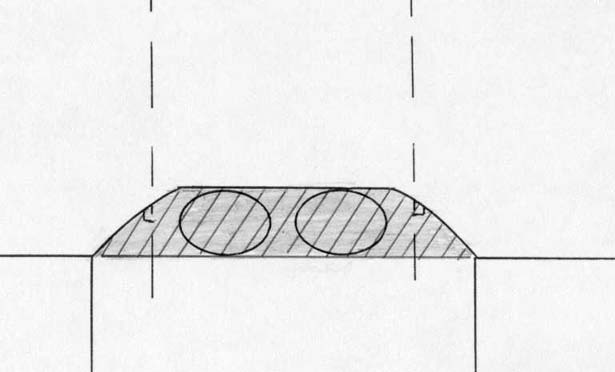 When designing the intake port / manifold runner, the measurement of the length of the roof should equal the length of the runner and port floor (including the short turn radius). This provides equal surface friction for the length of the port and will help keep the mixture intact by reducing the tendency to shear the flow. The texture of the intake runner and port should be consistently coarse to prevent boundary layer build up and the resultant tendency to develop surface tension and subsequent fuel attachment. The port itself should be configured to work with the chamber and cylinder wall to create a flow bias that will tend to cause rotation of the mixture in the cylinder, which we now call swirl. The studies and tests all indicate that its indeed possible to design ports and surrounding areas in the cylinder to allow optimal swirl frequency at almost all RPM ranges. How Can It Really Work? Since the RPM and swirl combination are still thought by many "experts" to only work at specific and narrow RPM ranges, I need to address this issue before continuing. Those of you familiar with air flow studies understand both the elastic and compressible properties of air and you should also understand how air flow is easily "cheated." One example is the old port designer's tricks with sharp short turn radiuses, which can cause enough turbulence at their peaks to make the main body of the flow "think" that the short turn is actually higher with a more optimal configuration, thus enhancing the flow rates. The ability to separate a small amount of air from the "bulk" of the flow and use it to "blow" new boundaries is actually more effective than physical dimension changes to the port. This technology allows the port shape that the airflow "sees" to actually vary and be flow-optimized for all RPM ranges. Jet Fighters vs. Cylinder Heads? Another "easy to see" example is in the inlet design for many high performance jet aircraft. Jet engines do not like supersonic flow at the entry or compressor side. The fix has always been the design and utilization of a variable geometry inlet, which can open and close the inlet area to keep the airflow agreeable with the engine. The General Dynamics engineering team changed all that with the F-16 lightweight multi-role fighter. They engineered a unique under-hanging inlet, which used the airflow vectored by the front raydome shape to alter the inlet cross section available for the airflow entry. The faster the airplane went, the less inlet area was presented to the oncoming air and the engine was happy at both subsonic and supersonic speeds. The fact that they were able to "cheat" the airflow allowed the airplane to cost less and also weigh less than the articulated alternative. You can see this same engineering in both the Boeing and Lockheed Martin JSF designs. Applied to inlet ports, we are able to allow the flow velocity to dictate which portion of the port will influence it into the cylinder. As RPM and velocity increase, it's relatively easy to design the port to maintain a reasonably constant frequency and "friendly" bore radius for flow rotation in the cylinder. This prevents excessive degradation of the swirl/mixture quality at low RPM and it also prevents the probability of wet-out in the cylinder due to increased rotational velocity at high RPM. In the case of port modification, it's now possible to design ports that run well at all RPM ranges, without great tendencies to favor a narrow operating band. Complex? Not really. It's simply the result of studying all the variables involved and optimizing each to work in harmony with all the other parts of the engine. My associates call it the "leave no stone unturned" method and experience has repeatedly shown that, if we don't look everywhere, someone else will, and they'll kick our asses. All our original data that was made public indicated that we were achieving a very homogenous mixture in the cylinder with swirl inducing ports. The increased power and fuel efficiency were simply due to better mixture quality control prior to ignition and during the "confined" burn on the exhaust side of the chamber. Our assumptions were only partially correct. As we were able to more readily study the contents of the cylinder mixture with more sophisticated equipment, we were amazed to find that the mixture was homogenous, but also layered as we sampled the cylinders entire contents from top to bottom. These layers are like stacked disks of homogenous air and fuel mixture. The uppermost layers are of about 12 -1 air/fuel ratio with each lower layer blending to leaner consecutive layers as we progress to the bottom of the cylinder. The lower layers are frequently at mixtures of 28-1 or leaner, which can not be ignited by spark ignition. During the final stages of compression, the upper mixture at 12-1 is easily ignited and, as the spark plug is physically located high in the combustion chamber, the upper "rich" layers are the first ignited. The remaining layers of ever-leaner air/fuel ratios are being pushed upward and they are progressively ignited easily by the burning upper layers. This means that, were you to simply analyze the overall cylinder content, the average air/fuel ratio would likely average 18 -1 or lower and keep in mind that these are not engines destined for economy runs. While we thought we were doing a better job of mixture introduction prior to ignition, we were actually creating engines with stratified charge combustion characteristics. If you look back, Honda introduced the concept to production engines by using a pre-combustion chamber with a tiny intake valve and the spark plug housed in it. The pre-chamber was linked to the actual combustion chamber by a large hole. The pre-chamber inhaled a rich air/fuel mixture through the small intake valve, while the main chamber inhaled a mixture, which was very lean and difficult to light. The spark plug ignited the rich mixture in the small chamber and the burn spread to the main chamber where it was capable of creating a very thorough burn, which, at the time, negated the need for a catalytic converter. So we came up with a simple (less moving parts) way to achieve stratified charge combustion that also tended to produce good power, and was also "soft" in its ability to tolerate extremely variable mixtures and ignition curves without damage from detonation. Normally when designing the chamber and piston configuration we never check the static compression ratio as long as the "combustion space" is acceptable, regardless of application (normally aspirated or force fed.) We have found that many of our engine's compression ratios were well over 23-1, and we also learned that allowing new customers to know those numbers was not always good for business. Monday mornings are still always fun when we get the call regarding how well the combinations ran, then well let them to know part of the reason why. Regardless of the weekend performance, it still scares them to death. Some other interesting observations weve made during these years of testing have also lead us to now believe more than ever that the old definition of engines merely being glorified air pumps is simply not the case. Weve worked many a program where we used a record holding engine as a base line. In every instance, when the "soft" counterpart was tested, wed gain perhaps only 8-10% more usable power, but the recovery time and acceleration rates were in a league all their own. As one would expect, the specific fuel consumption was always lower, but in every case the specific airflow requirement for the engine dropped considerably as well. So, now were making more power with the same displacement at the same or hopefully lower rpm ranges, and the engines consuming both less air and fuel. This not only verifies the fact that were achieving greater combustion efficiency, but the airflow relative to power notions that most believe in are no longer applicable. Another brief note: Horsepower and torque numbers from dyno testing are next to useless in our opinion. We have NEVER had an engine that produced big dyno power numbers dominate competition. The only numbers we pay attention to are those that relate to recovery and acceleration capabilities. Horsepower is only a bragging number and it's really only applicable to steady-state engine operation. The engines we design and produce are only running steady-state when idling or following the pace car. Nuff said. Coming To Your Car Dealer Soon! At the current rate of combustion technology development, combined with many new low-friction and reflective materials we can now use for construction, I firmly believe that, with the exception of the exhaust gas temperatures, adiabatic engines with no cooling systems and regenerative cylinder walls are close at hand. Youre also going to see some engines running fuels that are also "free" shortly. These are exciting times, indeed. .that's a good question. Swirl is swirl, right?, and it seems that every now and then someone who has "credibility" mentions it relative to their programs. Its also a key marketing tool for people who produce everything from bogus fixed blades you set on top of your carburetors to cylinder heads, which is where it all began. I suspect that this update may create another controversy like the first edition did back in 85. Both the industry and Endyn have profited from our controversial programs and, if another controversy is necessary to inspire "engine people" to look in some new directions, I've done my job well, even if I get stoned by the "experts" again. I once again thank Al Kirschenbaum for his comments. I'm not sure that I'd have written a revision had it not been for his article. I also want thank my mentor for making me read all the books, which forced me to build all of my own equipment and to follow the test data they produced rather than the "mainstream." E1 is a cross sectional view through the side of the cylinder and chamber at the valve axis. This is a current 4 valve chamber that is easily adapted to numerous project engines. 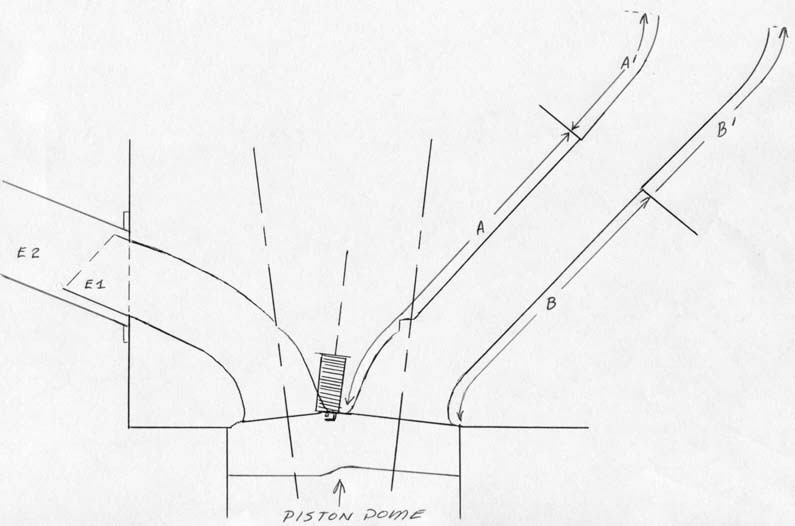 Note the shallow valve angles relative to the bore vertical centerline. This produces a chamber shape, which has relatively little depth and with a central plug location, it's very efficient. There are several points of interest in this drawing. First note that the intake manifold is a little smaller at the mating surface of the intake port in the head. This is good practice, as there will be room for slight misalignment during assembly that will no longer cause the intake charge to hit a square edge. The reverse ridge also helps prevent reversion from traveling back into the manifold. Also illustrated on the intake side are the dimensions of the port / manifold floor ( B + B' ) and the roof ( A + A' ). Note the relative lengths are the same with the intake runner configuration providing the proper lengths to the port. This will prevent unequal surface friction from shearing the inlet flow with a resulting degradation of mixture delivery to the cylinder. On the exhaust side, we frequently extend the "port" with a short stack of very thin wall tubing that is a continuation of the exhaust port shape. This is inside the first portions of the primary header tube and it extends the port for more torque while discouraging reverse flow. Any header overlap possible is mandatory on the exhaust side to prevent entry of burned inert gasses from reentering the chamber and contaminating the fresh mixture. We design all exhaust ports with header primary tubes in place, so there's no problem with positive flow, but reverse flow is tremendously discouraged. Figure E2 E2 is the same view as E 1, but the piston's at TDC. Note that the dome to chamber interface forces almost all the mixture to the exhaust side ( sweet spot) for the burn. Head / pistons of this configuration are very efficient and just as the "trench" design, the tendency to detonate is almost completely eliminated. Figure N1 N1 depicts a typical 2 valve cylinder / combustion chamber lay out. 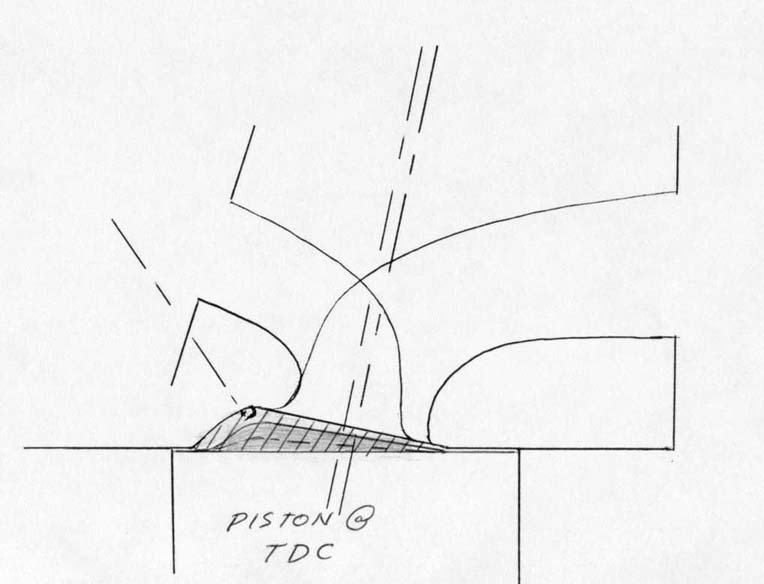 This side sectional illustration shows the plug bias to the exhaust side with a large intake side quench pad and a small one on the exhaust side. 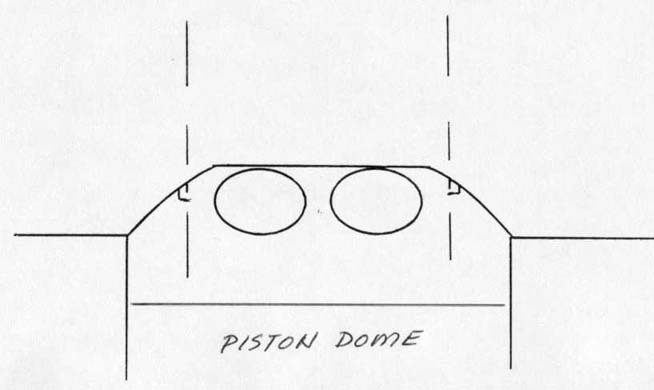 The piston dome is a multilevel configuration. 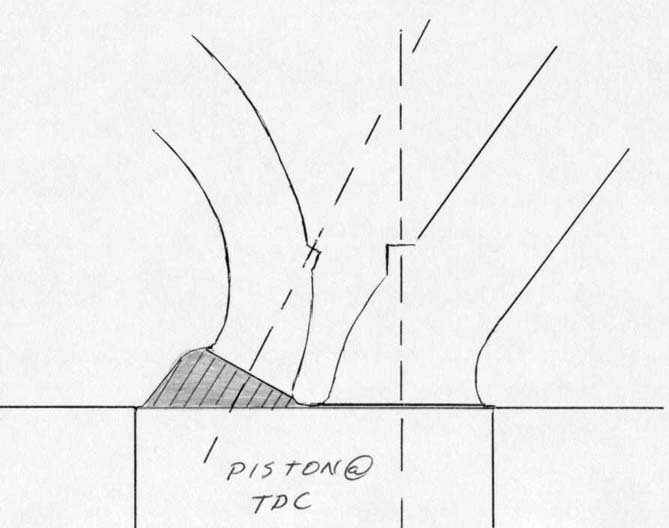 Figure N2 N2 is the same illustration with the piston at TDC. Note that there is marginal mixture confinement, but the greatest volume does favor the plug / exhaust side. Figure N3 N3 is a sectional view of from the exhaust side of the same head configuration. The piston is still down in the bore. Figure N4 N4 shows the same view with the piston at TDC. Note how effective the dome configuration is at displacing the chamber volume and forcing the majority of the mixture to the exhaust side (sweet spot) where the plug resides. Figure H1 H1 shows a deep pent roof chamber as the Honda street engines use. Note the undesirable depth of the combustion chamber and the large included valve stem angles. 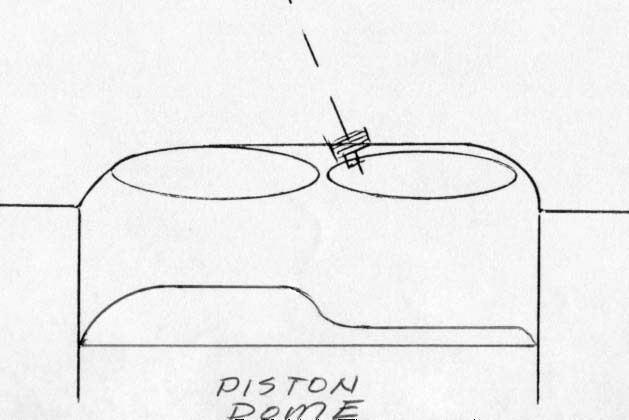 This view also shows the piston with "our" dome down in the bore. Figure H2 H2 is the same as H 1, but the piston is at TDC. Note the dome design is displacing almost the entire mixture to the exhaust side for the burn. This piston / chamber interface is why we can run this configuration on both N/A and blown engines. The static compression ratio is high, but in order to achieve the combustion kinetics we desire, it must be. This chamber bias is the basis of the "Soft Head" and. As you can see, it's easily adapted to many engine styles.